We stayed at Cactus Petes RV Park in Jackpot, Nevada, for the first time last night and it certainly won’t be the last time — what a great find! Prior to this winter’s trip south, we’ve always stayed in and around Twin Falls, Idaho, mostly at the 93RV Park in Filer. Jackpot, Nevada is a mere 44 miles south of Filer. Cactus Petes campground is easily accessible off Highway 93 with uber long pull-through spaces close to the Casino. You simply pull in and pay your $18 (for the south park) or $20 (for the north park) at the hotel’s front desk. 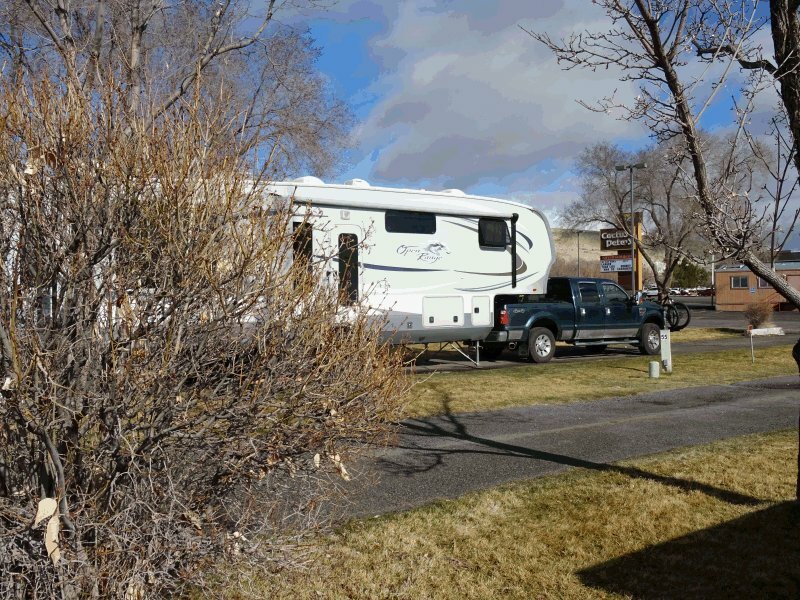 The north park campground is a tiny bit further from Cactus Pete’s Casino and has many more trees for privacy between the sites than the south park. The campground itself is super clean and numerous covered garbage receptacles are available throughout the park. In the short time that we were there (and looking out the window) we saw at least 5 campground staff attending to campground park services. So NOT Circus Circus! The only drawback was that we discovered too late that there was no water available at the site. Because their water supplies aren’t heated, they keep them turned off until May. Winter lasts a long time at 5700′ ASL. There is, however, a drinking water supply available for filling up your tanks at the end of the north park. Cactus Petes Casino itself was a very nice surprise. There were LOTS of visitors there on an afternoon/early evening in late March, along with LOTS of nice staff to serve them. In between poker, we partook of Fishermen’s Keep at the Buffet. It was SO SO good! I was absolutely impressed with the variety of the items on the buffet – manicotti, stuffed shells, crab cakes, mussels, cod, salmon, crab salad, tortellini and so much more. And seriously, how does anyone cook and keep asparagus tasting so good on a buffet? That was amazing! Anyway, as I said earlier, we’ll be back in the fall on our journey south and will plan to partake in the Friday / Saturday seafood buffet!